As you may know, I adore Margaret Atwood. At the beginning of the semester, when I learned she would be coming to my university, I nearly jumped with glee. I told everyone I know. They didn’t really care (I’m friends with too many pre-med people), but whatever. What’s more, I learned through the grapevine (aka the English Club list-serv) that I could sign up for a Q&A the morning after the talk! Basically, I was in heaven. I waited and waited, and finally March 30th rolled around. I got to the auditorium nice and early, snagging myself a seat in the third row (nice and close, but not so close I have to crane my neck). Atwood was introduced by J. Robert Lennon, an author and Creative Writing professor here who wrote a fantastic article last fall about Atwood for The Walrus. And then…Atwood came out onto the stage. I literally held my breath. I was in complete disbelief that she was actually standing there, just a few yards from where I was sitting. I thought I was going to pass out. But I didn’t. And then she started talking, and started reading. She read a few absolutely hysterical stories from The Tent (including one depicting her cat’s discussion with God, and another called “Three Novels I Won’t Be Writing Soon,” such as “Worm Zero,” in which all of the worms in the world die), a couple non-humorous but still amazing poems, and an excerpt from The Year of the Flood. She then took a few questions, which she answered wittily and thoroughly, going so far as to ask one girl what more she would like to know. Basically, I left Atwood’s talk thinking that if it was even possible for me to adore her even more, I now did. The following morning, I woke up bright and early for a student Q&A, and this time, I was literally 3 feet away from her. It took a lot of self-restraint to keep myself from jumping up and hugging her. I did take notes during the Q&A, so here are some of the questions and her (paraphrased, sorry) responses. Sorry these are kind of random/disorganized. She covered a lot in her responses, and I thought you guys might want to read some of them. Someone asked her what her favorite part of The Handmaid’s Tale was, but she said that she doesn’t like reading her own work because she knows what will happen. Instead, she discussed the origins of the novel: she wrote it in Poland, Czechoslovakia, where no one could talk about anything anywhere for fear of being overheard, and Alabama, in the hometown of the KKK. She also explained that if she wrote the novel now, it would be much different because of all of the new technology we have. Why are science fiction covers so embarrassing? The creators of the covers think that you need to be able to classify the book, even though these books often transcend the genre. - If you’re stuck when writing, change the voice (1st to 3rd, etc). She explained that Alias Grace began in 3rd person, but then she started over in a different voice because she realized that the narrator knew too much. - Take into consideration the relationship between the speaker and their audience. For example, Jimmy in Oryx & Crake doesn’t keep a journal because there isn’t anyone to read it! - The stumbling block to dystopia is that the writer can try to explain too much, and then we get bogged down. And the best part of the Q&A? At the end, I went up to her to get my book signed (The Blind Assassin, which I happen to be reading right now so I have it with me at school), and I mentioned that I write for The Broke & the Bookish and that I had written a piece about her last fall, and she seemed to remember it! Yay! Sorry if this post was long and rambly. Seeing Margaret Atwood was one of those things I thought would never actually happen, and, honestly, I think I’m still kind of in denial that I really did meet her! I want your life. I am insanely jealous right now. No one of any real importance ever comes to my campus and I never hear about things at other campuses until they've already past. Margaret Atwood seems to be just as amazing a human being as she is an author. I was worried that I'd read this article and think "Oh, God, Atwood's actually a real jerk" but thankfully that didn't happen. What an amazing experience! I am also a huge Margaret Atwood fan and have heard her interviewed many times on the radio, but would love to meet her in person. I am so happy for you and so jealous at the same time. 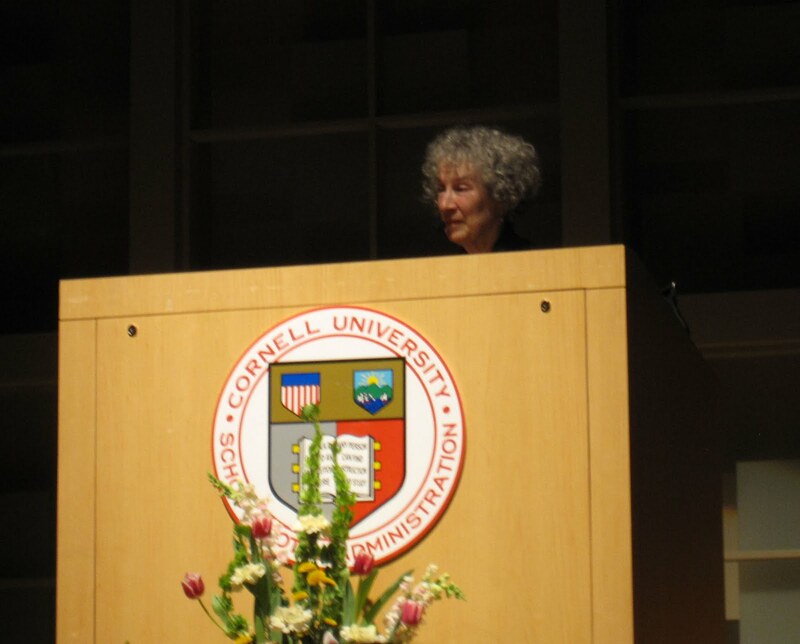 I grew up in that area, and when I heard Margaret Atwood was going to be speaking at Cornell, I was so upset that I couldn't make the trip home to see her. Thank you for this wonderful account of what you experienced. Thank you thank you thank you for sharing this! As a writer, I dream, I yearn for the day someone compares my work to Atwood. I am far, far away from it, but she is one of my heroes. I am so jealous! My campus has never had anyone this noteworthy come. Well, that's a lie. We had Joyce Carol Oates once, but her tickets sold out in a day so I didn't get to see her. But I would be first in line for a ticket to see Margaret Atwood. le sigh. How awesome! I'm glad she met your expectations. I had the pleasure of meeting Markus Zusak, and it was so awesome that he was such a great guy. And way to go being brave and asking a question. I'm too chicken. I am so jealous! I am such a big fan of hers. Thanks for the great post! What a lovely fangirl report! Thanks for sharing. I think it's so nice that you had a chance to meet a favorite author. Thanks for that. I love Atwood too and this was very intersting. Anna here- I love Margaret Atwood, it's fantastic that you met her! This was really interesting to read, she sounds like a facinating woman! Geeking out, Atwood is the greatest. And I LOVE Blind Assassin, it's tied with Handmaid's Tale for favorite, lucky you to have a signed copy, give it kiss for me! Jessi Reviews "I Am America (And So Can You!)" Julia Reviews the Pun Also Rises + Giveaway!